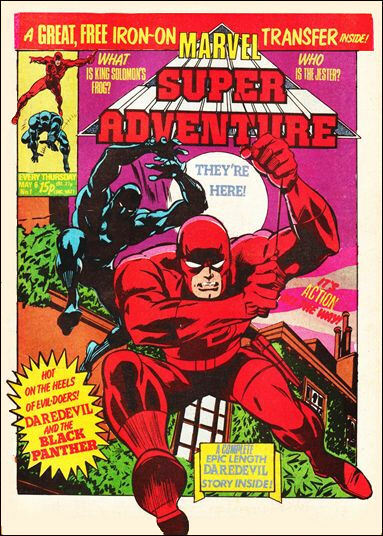 Comments: The first issue of Marvel Super Adventure was released by Marvel UK on 6th May 1981, though the title had been previously used the year before for a Winter Special with completely different strips (Defenders, Iron Fist, Sub-Mariner) than those reprinted in the new weekly. Throughout the title's short run, it featured the same strips: reprints of Black Panther and Daredevil, plus Tim Quinn and Dicky Howett's humour strip Earth 331/3; the first three issues also included free iron on transfers of Marvel characters to try and encourage readers to try out the new title. It cancelled with issue #26 on 28th October 1981; a week later Marvel Super Adventure merged with Captain America #37.